Cooks healthy, flavorful meals, fast and easy! The smart choice for preparing today's lower calorie foods. Cooks three to ten times faster than ordinary cooking methods! Saves times, energy, and money. 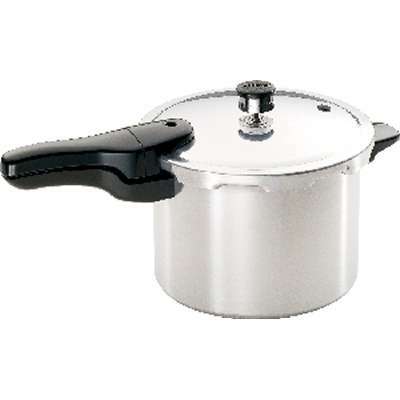 Pressure cooking preserves flavors and nutrients, and even tenderizes lean cuts of meat. Pressure regulator maintains the proper cooking pressure automatically. Ideal for use on regular and smooth-top ranges. Strong, heavy-gauge aluminum for quick, even heating, easy cleaning, and long life.